Aliza Sherman is a Web pioneer, social media veteran, published author, blogger, podcaster, and regular contributor to national magazines and web sites. Fast Company named her one of the “Most Influential Women in Technology.” Aliza is the Original Cybergrrl – an Internet thought leader, highly sought-after Web consultant and passionate evangelist for the Internet. Her groundbreaking 1990s Internet company, Cybergrrl, Inc., built the very first sites for companies such as Dr. Atkins and the Atkins Center, brands like Origins and Jane Cosmetics for the Estee Lauder Company, and Avon Product’s initial foray onto the Web with a web site and AOL forum for Avon’s Breast Cancer Awareness Crusade. Aliza also started the first online and offline global women’s organization Webgrrls International that at its peak had over 100 chapters worldwide and over 30,000 women participating online. Today, Aliza’s social media marketing agency Conversify works with clients from Alaska to the United Kingdom including Alaska State Fair, The Rasmuson Foundation, Marine Conservation Alliance, American Indian College Fund, Wine Sisterhood, and Romane Fragrances. Aliza is an avid Twitterer, blogger and podcaster with a background as a radio and television producer. Aliza speaks around the world about the Internet, social media, online marketing, virtual worlds, entrepreneurship and women’s empowerment. Speaking clients have included the Web 2.0 Expo; BlogWorld Expo; BlogHer; Women’s Forum for the Economy & Society (WEFCOS) in Deauville, France; Society of American Travel Writer Annual Conference in Santiago, Chile; Arthur Anderson Executive Women’s Circle, Arthur Anderson Enterprise Symposium (Orlando, FL); Technology Conference for Women’s NGOs, De Haag, Netherlands; Links Education Technology Conference, Stockholm, Sweden; 1999 Women Leaders Conferemce, Wellington, New Zealand; 1999 Women’s Summit of the Americas, Buenos Aires, Argentina; as well as Harvard Business School, Simmons College Graduate School of Management, Columbia School of Business, Rutgers, New York University and Boston College. Named by Newsweek as one of the “Top 50 People Who Matter Most on the Internet,” Aliza continues to be recognized as a leader in the ever-evolving landscape of Internet and social media, marketing and communications. Her books include The Everything Blogging Book, Streetwise Ecommerce, and PowerTools for Women in Business. Excited that I just found a new set of podcasts you have done on iTunes. I am thinking of jumping from blogger to wordpress. I have written a book on accounting software and need a new website. I see that you use wordpress, do you think I should start with the free version or just jump into the paid version? Show #10: Are you overwhelmed by status updates? Show #9: Zen of Being Digital Podcast: Do more followers make you happy? Show #8: Zen of Being Digital Podcast: Are You a Spammer? 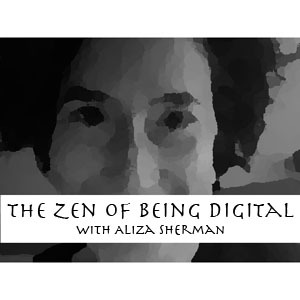 Show #7: Zen of Being Digital Podcast: Are You Tethered to Your Mobile Device? Show #6: Zen of Being Digital Podcast: Can You Get to Inbox Zero?